The largest visitor centre in the region, the Bunbury Visitor Centre is located in the historic Railway Station overlooking Leschenault Inlet. Visitors to the Centre are welcomed by a team of friendly, highly-trained and knowledgeable staff ready to showcase what Bunbury Geographe has to offer. Sunday: 10am – 2pm. Public Holidays: 10am – 2pm. Closed Good Friday and Christmas Day. The Balingup Visitor Center, located on the main street – look for the painted cow. Knowledgeable staff and committed volunteers are very happy to assist visitors, offering a free accommodation booking service, information on local attractions, events and tours. 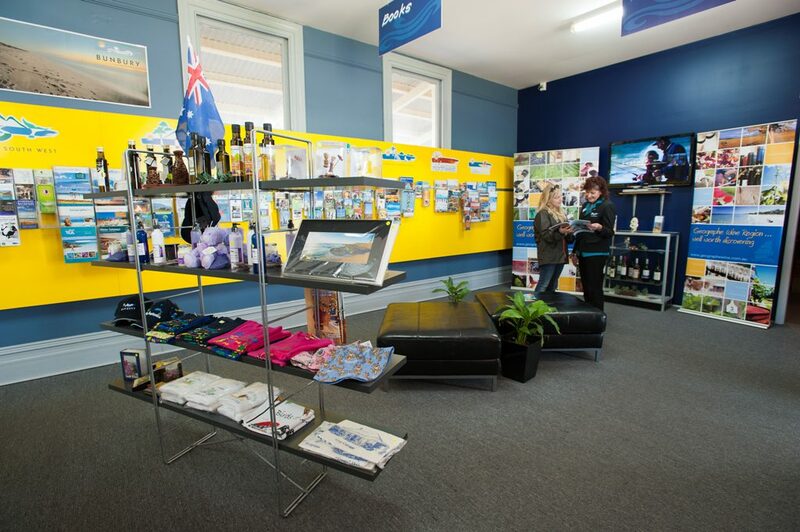 The Balingup Visitors Centre is operated by the Balingup and Districts Tourism Association Inc. The Centre is staffed by volunteers and a part-time manager. 10am – 3pm, 7 days a week. The Boyup Brook Visitor Centre is a must stop when visiting the region, housing the Little Art Gallery, the world-famous Carnaby Beetle and Butterfly Collection, and the Krandals doll collection. Proudly supporting local artists and makers with shelves filled with things made in Boyup Brook. 10am – 4pm Monday to Friday. Only open on Saturday and Sunday when volunteers are available. The Collie Visitor Centre is conveniently located within 350 metres of the Collie CBD and has ample parking with long bays provided for vehicles towing caravans, trailers etc. Two ACROD parking bays are also provided, along with a picnic area with tables and seating. It is also the terminus for public transport services in Collie, including TransWA and South West Coachlines. The Donnybrook Visitor Centre is housed in the beautiful old railway station building in the centre of town, which also includes a pop-up museum of railway memorabilia. The Centre has plenty of free parking and is run by the Donnybrook Regional Tourism Association Inc.
Open 10am to 4pm Monday to Friday and on Market days (third Saturday each month). Subject to availability. Run by a group of local, friendly volunteers and Ferguson Valley Marketing, the Visitor Centre located in the historic Dardanup State School building (1897) and surrounded by the Memorial Rose Gardens. Souvenirs and local crafts including product from 5th Element Pottery and Glass Studio and Erindale Lavender Farm. Daily from 10am to 4pm. Closed Good Friday and Christmas Day. Subject to change. The Harvey Visitor Centre is open 7 days a week and is also home to the famous Moo Shoppe, which stocks the largest range of cow merchandise in the South West, plus a May Gibb Cuddle Pot and Snuggle Pie display.